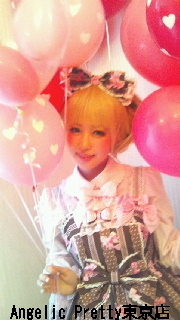 Coming Soon : Angelic Pretty Jewel Ribbon Series! The AP-Tokyo blog posted some photos, and the most recent issue of Kera also has pictures of a new AP series; Jewel Ribbon (ジュエルリボンシリーズ). I have a huge weakness for red x white polkadots, so when I first saw this ribbon-candy-stripe print in red, I was enamored. This is the first version of the JSK. As far as I can tell, the bodice is fully shirred. This is a little different for AP; they don’t put out fully shirred dresses very often. I really like the skirt on this, I love the polkadots, the colors and I’m even pretty sold on the ribbons, but I’m just not sure about the shirring on me. I think it’s awesome that they made a fully shirred JSK, because it’s going to fit some girls who might not normally fit into AP… but I don’t know if it will flatter my bodytype. The socks however, are absolute love. the front has a scalloped panel of polkadots and the sides are a bunch of bows. I know I want them in red. I don’t know for sure what other colors the socks come in yet, but if they come in other colors I wear often, I’ll probably pick them up in more than one color! 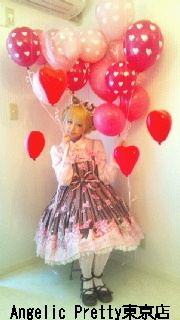 This is the other JSK cute. I like the bodice better on this one, but it’s got a tiered skirt, and I don’t like the way it looks when stripes are tiered personally. So while I do like this print; I think I’ll have to see more of it before I decide one way or the other. According to the journal entry from AP/kera the set contains these two JSKs, a head bow, a skirt and OTK socks. I’d like to see the skirt! It comes in a few different colors. Wine Red, Brown, Black x Pink and Black x Lavender. I wish the red was more red and less wine because it would match more things in my closet, but c’est la vie.